When you launch SplashID Safe for Windows you are presented with the Panel View, which displays a list of your items in a 3-panel layout. Items are records of information, like a credit card number and expiration date; or a username and password for a web-site. There is another useful view, List View, which you can select with the View Mode buttons toward the top of the window. Customizable Toolbar -- SplashID uses a ribbon UI for the toolbar that MS Office users will be familiar with. We'll go over the tools in the next section - Toolbar Ribbon. 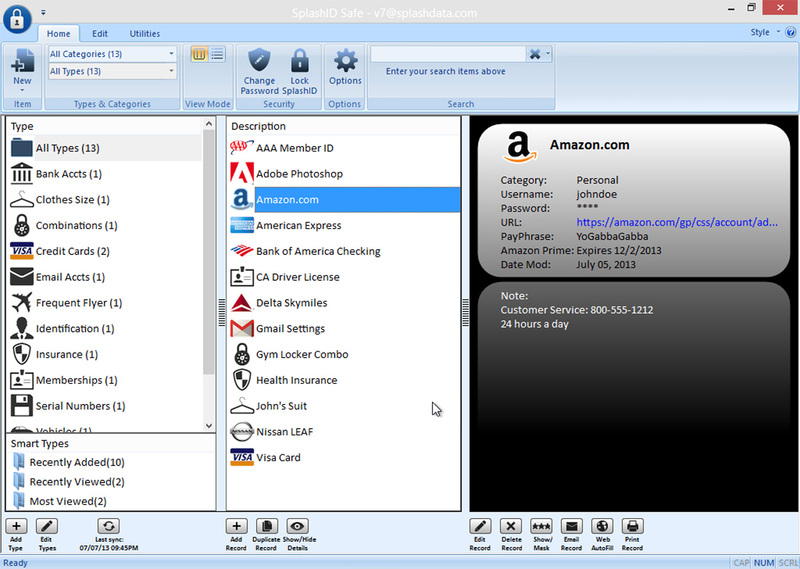 SplashID Safe for Windows has an MS Office style Toolbar Ribbon. You will find many of the tools in the 3 tabs of the ribbon. New -- Click to add a new record, type or category. Categories & Types -- Use the filters to restrict the list to only display items assigned to a specific Categories and Types. View Mode -- Use the View Mode buttons to select from the default Panel View, traditional List View, or hierarchical Tree View. Security -- Change your password or lock the application. Options -- Access the Options panel. Search -- Enter some text you want to search for and results will display instantly. Click the down arrow at the right to view search history. Clipboard -- Cut, copy and paste record(s) to/from the clipboard. 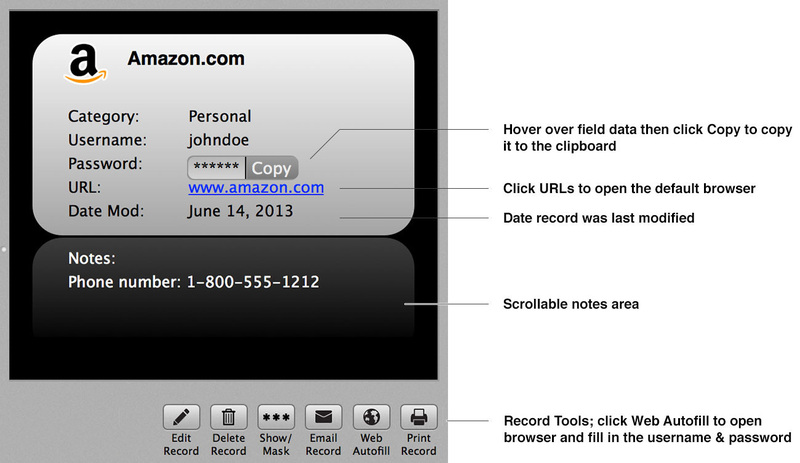 For security, clear passwords from the clipboard with the (you guessed it) "Clear" button. Copy Fields -- Hover your mouse pointer over the field you wish to copy, then click the Copy button to copy that field to the clipboard. Plugin -- You have the option of installing a browser plugin (Internet Explorer only) that will add a search box to the address bar. With this you can quickly look up a Web Login from your SplashID database. View -- View an activity log for tech support purposes. Enable/disable the Status Bar and Detail Pane. Anything not found here will likely be found in the bottom toolbar or in the Application menu indicated by the SplashID icon in the top left. Access the Application menu by clicking the SplashID icon in the top left. Edit -- Edit the selected item, set Custom Field Labels, or Add an Attachment (any file up to 1 MB) to the record for future reference. Attached files are saved in a folder next to the database. Import -- Import SplashID vID files, CSV files, and other export formats from similar applications. Export -- Export SplashID vID files for various versions as well as CSV plain text files that can be used for a number of applications. Backup -- Create a backup file of your database that can be imported at a later date. Print -- Print the list of records. DeDupe Items - Searches for duplicate records and offers to delete them. Check for Update -- See if there is a newer version of SplashID available for download. SplashID Feedback -- Send us feature requests, bug reports, etc. Logout -- Allows SplashID Cloud Services users to logout of the app, deleting the local data, while preserving the data in the cloud. About -- Displays version information. 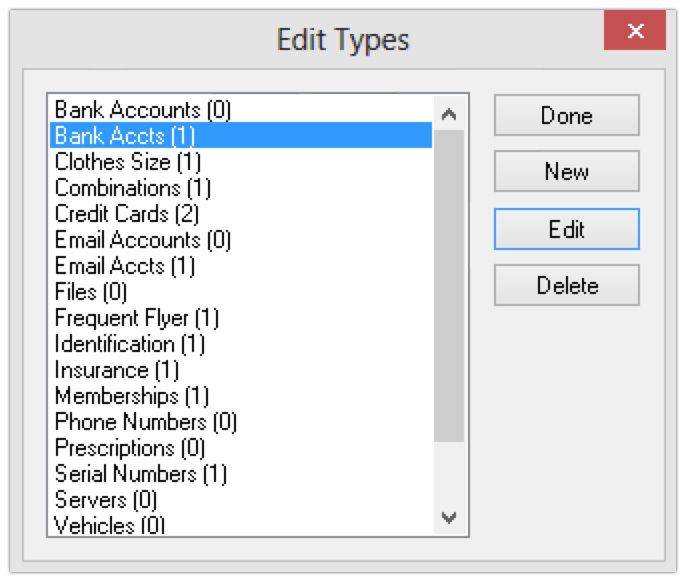 Your SplashID Account -- Opens the account type and sync settings dialog. 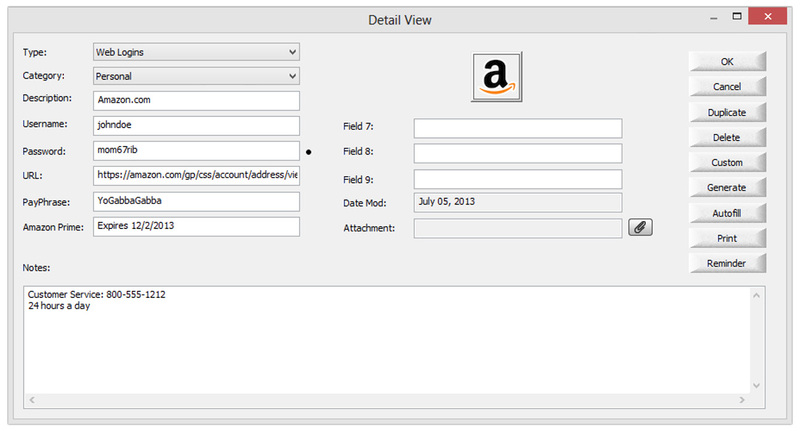 Display Options -- Customize the Quick Access toolbar as well as the style of the ribbon UI. Exit -- Close the application. When you double-click on a record in the Record List, it opens the Record Details on the right panel. This is also what you see when you click the New Record button from the Record List. Remember to click OK when you're done editing! Custom Field Labels -- You may assign Custom Field Labels by clicking the Custom button on the right. Masking -- A bullet appears to the right of any field that is masked. You may Customize the field masking by clicking the Custom button on the right. OK exits the record, saving any changes. Custom opens the Custom Field Label dialog. Autofill opens your web browser and fills in the username and password fields. Icon opens the icon selector. You can also add a custom icon to any record - just click Add Icons from the icon picker screen. Types act as templates, which define the structure for the items you want to store in SplashID. You may define up to nine Custom field labels and a default icon for each type, as well as specify the fields you wish to mask. Clear Clipboard -- Instruct SplashID to clear copied text from your system's clipboard on exit and/or after a specified number of minutes. Search Options -- Apply the search text to All Fields or Just Field 1. Minimize Options -- Minimize to the Task Bar (like most applications) or to the System Tray (bottom right - more compact). Auto-Submit Web Logins -- Check this box to automatically submit forms when using the Web Auto-fill feature. Database Location -- Select a Custom database location, including network locations. Note: You cannot select a folder that already contains a SplashID database. Default Backup Location -- Change the location that the automatic vID backup is saved to. Columns -- Select which field data columns you would like to display in the List View. 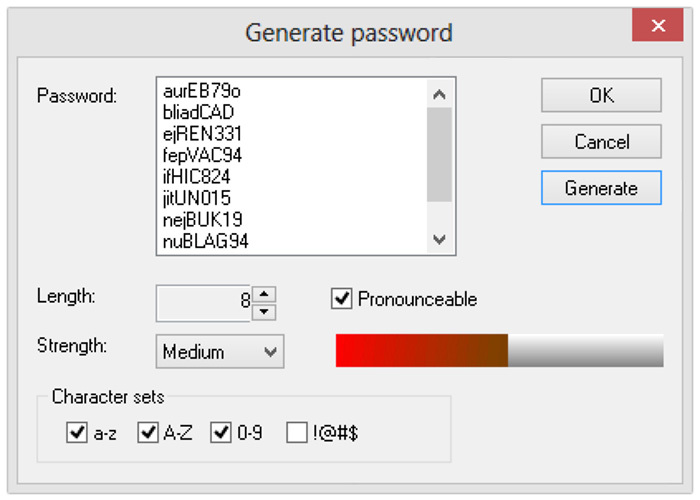 Changing a Password -- To change a password, select Change Password from the Security section on the Home toolbar, enter your Old Password, then enter and confirm the New Password. If you change your password on any version of SplashID Safe, it will be change across the board on other versions. This is true for Wi-Fi and No Sync account types as well. You will be required to enter the old and new passwords the next time you login to other versions. By default information is synchronized in both directions, but you can adjust the settings, in Sync settings which can be found in the Options dialog. Enter the IP address of the desktop computer, either on the local network or the public IP if connected directly to the Internet You can find this IP address in the SplashID Desktop under Options > Sync. If you later need to import this data, simply double-click the .vid file and you will be prompted for a password and the data will be imported into SplashID Safe. You may change the location that this file is backed up to in SplashID Safe Options. There is also an option in the Options screen to have a backup vID file emailed to you on a specified schedule (every day by default) so that you can potentially store this on an email server in case of catastrophic data loss such as a failed hard drive. You may also perform a manual backup of your data by selecting Backup from the File menu. This will export your SplashID Database in vID format to whatever location you select. You will be given the option to set a password as well, which will encrypt the data and require the password to import it. You may change the location that this file is saved to in SplashID Safe Options.